At Parramatta Dental Clinic, you’ll find expert help and guidance on how to choose the right solution for your missing teeth. In fact, with our expert help, no one will even notice that you have replacement teeth. If you’ve lost a tooth or even several teeth, we can help. Two of the options we offer are dental implants and dentures. 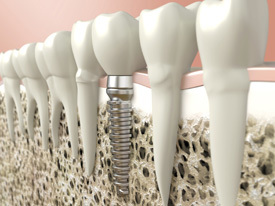 Dental implants are a great option that consist of a high-grade titanium screw placed into your jawbone. Implants look great, feel natural and are undetectable to the naked eye. As long as you maintain good oral hygiene, the implant remains firmly in place and feels just like a natural tooth. Unlike dentures, implants are a stable, permanent solution and do not get dislodged from the mouth during speech or swallowing. They’re the best choice to replace one or multiple teeth and come in several shapes, sizes and materials. Dentures have been around for a long time and have gained a bad reputation. Well-made dentures, however, fit extremely well, are stable and look completely natural. If you opt for dentures, our resident expert will measure your jaws and custom-create your dentures over a period of one month. Not only will they fit you perfectly, but you will know that they are comfortable, aesthetic and stable. We understand that these options can be costly. As a result, we will do our best to work with you and provide expert help with financing and payment plans. Let us know how you want to structure your payment plan and we will work with you to make it happen. Get the affordable, high-quality dental care you deserve. Contact us today on (02) 8677 0155 to book your time. We’re open seven days per week with extended hours available.